PCXX-30/115AC (series) Switch-mode, dual output-voltage supply with a -40C to +85C operating ambient temperature. 5 year warranty. $104 (OEM discounts available). 115/230VAC input voltage. 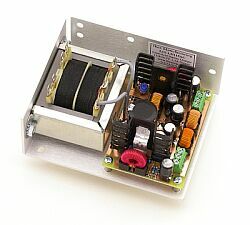 30 watts total output power up to +85C (40W up to +45C) with a 3A limit per output. Available output-voltage options range from 3.3V to 24V.